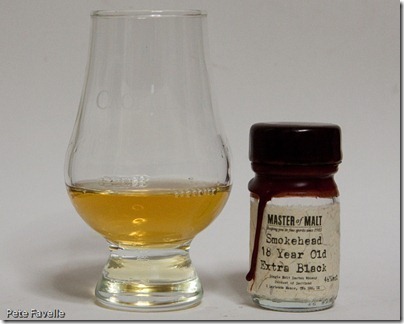 I’m a sucker for smoke in my whisky, so something with a name like this is always going to catch my eye – well aged, smoky and black, how could it fail to appeal to an Islayphile? 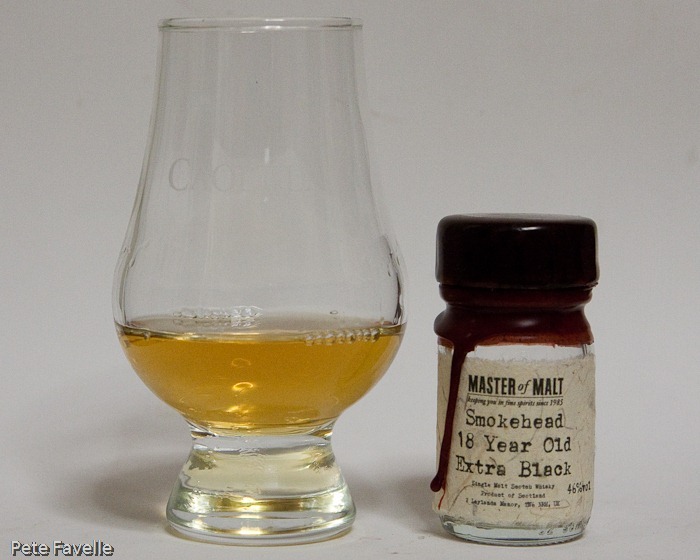 You may be forgiven for assuming from the name that this was going to be a dark dram in the glass, but the Smokehead 18 Year Old Extra Black is actually comparatively light coloured. The aroma, however, is so smoke-filled I was half expecting to find my nose covered in soot – a proper bonfire in the glass, laced with a big alcohol hit. Underneath that you can just about discern a raw grain that surprises me in an 18 year old. Then there’s just a whiff of TCP; something I’ve often seen in tasting notes and never managed to detect myself before. With a splash of water cutting back on that smoke just a little, those medicinal notes come through more, and a suggestion of green fruit. The first taste is spectacular; deep smoke feeding through to almost toffee sweetness and then a huge warming alcohol filling your mouth. That smoke and heat makes it feel like you have a small camp fire on your tongue, but in a very, very good way. Water takes away that bonfire assault on your senses; what remains is that sweetness tempered with some spice, and with just a slightly rough, tannic edge to the tail. Still nice, and very drinkable, but a shadow of it’s undiluted self. Watered, this is a pretty damn tasty, smoky whisky. Undiluted, it’s a spectacular glass of smouldering deliciousness. Are you off to Islay? We’ve been twice and love it… we’re heading up next year again… can’t wait. Have a great time! I’m also a sucker for smoke – maybe we can find some of this and give it a try. I quite often walk into the kitchen in the morning after someone has been drinking whisky the night before and genuinely wonder what’s been on fire until I isolate the smell to last night’s glasses. Crazy. @Miss whiplash – two different things. TCP is trichlorophenol compounds from within the organic matter in the peat smoke. Iodine is more likely a note from sea air/dilution water perhaps and has a different taste to TCP.